The Granite Gurus: A Reader's Request...Help With Granite! 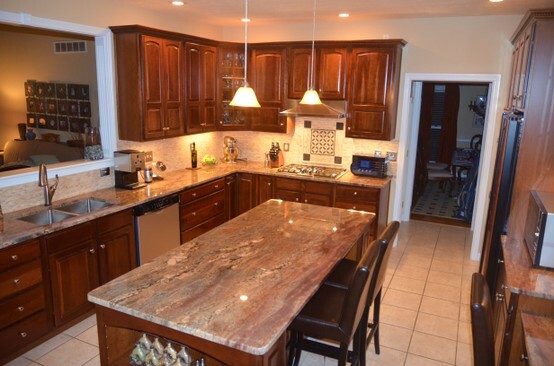 A Reader's Request...Help With Granite! 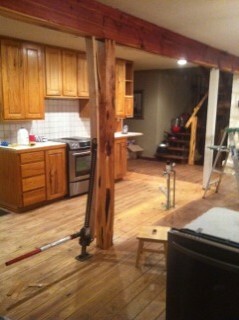 "....my kitchen its very small and I added cedar poles as support and ripped out the ugly sheet rock ones also.... there is a cedar beam running through the kitchen the glazed cabinets are the new ones and I have no idea what granite to use . I thought about crema Bordeaux but I live on a ranch and my house is rustic and I dint know if it's too wild. Can u give me a suggestion??? Help from Texas!!!" Thanks for the question Shannon. In rustic kitchens I actually like the granite colors that have more movement in them, like the Crema Bordeaux. I don't think it's too busy at all. The Crema Bordeaux would add some nice color and warmth to your kitchen. Smokey Mountain would be a beautiful color as well. It's similar to the Crema Bordeaux but doesn't have as much red. It has beautiful dark chocolate browns in it that would contrast well with your cabinets. Spectrus granite would be really pretty on your cabinets. It's quite different from the Crema Bordeaux but the blacks in it would contrast well and add depth to your kitchen. This is a kitchen we used Spectrus in a few years ago. My last suggestion would be the Magma Gold granite. It may be a little dark for the room, it's going to depend on how much natural light you have. Again though, it would be a great contrast on your cabinets and add depth to your kitchen. Good luck Shannon! Hopefully this helps you make your decision. If you need some stone advice you'd like to see answered here send me an email!